This toddler jungle gym have many attractions for kids on different age group, on front have soft play equipment,plastic house, kids swivel chair, table and chair for parents. 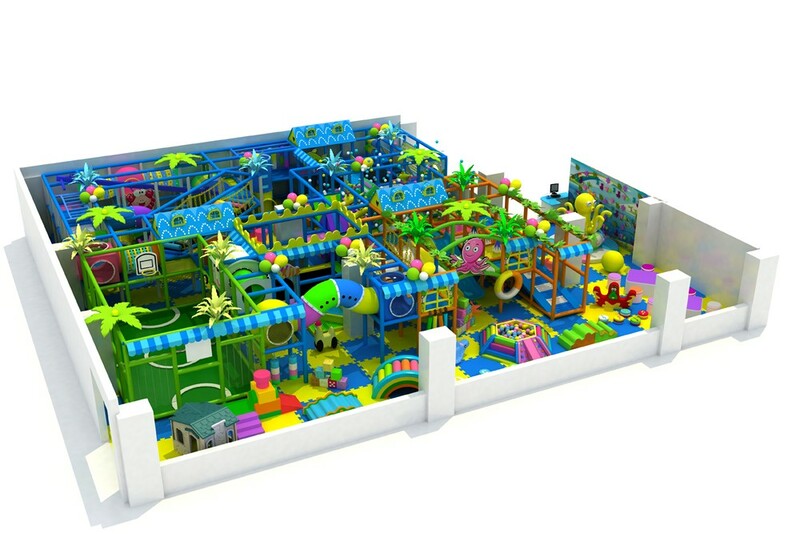 On main play structures have trampoline, ocean ball area, sponge ball blaster area, football play area. Also with different kinds of slide, one big bridge connecting in the middle, so kids more easy to reach all game. Is A Good Playground Necessary For Kids? Today’s society has become a society for material abundance and child spoiling has become an increasing common phenomenon in most of the families. Though they are well equipped with good education, abundant living material as well as enough attention from their family members, the only child in the family can still be somewhat lonely for lack of close friends and little chance of game playing. The scantiness can lead to shy character, or worse, autism and egoism. So a good outdoor playground or an indoor playground can be very helpful for those who feel lonely and autistic to get out of the shade of self-pity. Actually, a good playground is not only necessary, but also of great benefit for your kids. We all know that most parents nowadays would like contribute all they have to cultivate their kids except one thing, the freedom of playing. They over neglected the fact that their over brimmed love has already turned into a lock that invisibly influence their ability of thinking and living independently. Some parents even keep the playgrounds away from kids, no matter indoor or outdoor, for some unexpected harm that would do on their kids. I think that is really a bad action of over protected. To be honest, a good playground does well to your kids not only physically, but also mentally. First, a good playground can not only please your kids, but will also teach them what is teamwork and how to get along with other people. They may get rid of their thought of egoism through making friends and playing games about teamwork with them. At the same time, their feeling of being lonely can be erased too. In addition, parents can learn what your kids are really interested in by watching what they are doing while playing with them, also your relationship will be largely improved if you have a better understanding of your kids. Last but not least, it is a good place to educate your kids about good and wrong, because good emotion and happy playing environment gives you kids more patience and obedience to listen to you. So according the analysis above, I can simply say that a good playground, indoor or outdoor, is not only necessary for kid, but also of great importance for their growth. I’m sure the playground is the best places where kids can learn what cannot be taught at either home or school. So take your kids to the playground to take a good rest right now!